How to Cite This Chapter: Douketis J, Niżankowski R. Deep Vein Thrombosis. McMaster Textbook of Internal Medicine. Kraków: Medycyna Praktyczna. https://empendium.com/mcmtextbook/chapter/B31.II.2.33.1 Accessed April 20, 2019. 1) Impaired blood flow (eg, due to immobilization of the limb or compression of the veins). 2) Procoagulant activity prevailing over the effects of coagulation inhibitors and fibrinolytic factors (congenital or acquired thrombophilia). 3) A damaged vascular wall (eg, as a result of injury during surgical procedures on a limb). 1) Patient-related factors and clinical conditions: Age >40 (the risk increases with age), obesity (body mass index >30 kg/m2), prior episodes of venous thromboembolism (VTE), trauma (particularly multiorgan trauma or fractures of the pelvis, proximal femur, and other long bones of the lower extremities), prolonged immobilization of the lower limb (eg, due to paresis, immobilization of 2 adjacent joints in a cast, general anesthesia [in particular involving muscle relaxants]), a stroke that resulted in lower limb paresis, cancer (particularly pancreatic, brain, lung, ovarian, and kidney), a family history of VTE, congenital or acquired thrombophilia (particularly antithrombin deficiency and antiphospholipid syndrome), sepsis, medical treatment of a severe debilitating disease (eg, severe pneumonia), New York Heart Association class III or IV heart failure, respiratory failure, autoimmune diseases (eg, Crohn disease, ulcerative colitis, systemic lupus erythematosus), nephrotic syndrome, myeloproliferative neoplasms, paroxysmal nocturnal hemoglobinuria, venous compression (eg, due to a tumor, hematoma, arterial malformation), pregnancy and postpartum, a long flight (>6 hours, particularly when sleeping in a sitting position), varicose veins of the lower extremities, severe infection. 2) Diagnostic, therapeutic, and prophylactic interventions: Major surgery, particularly involving the lower extremities, pelvis, and abdomen; an indwelling catheter in the large veins (particularly in the femoral vein); cancer treatment (chemotherapy, hormone therapy, and particularly the use of angiogenesis inhibitors); use of oral contraceptives, hormone replacement therapy, or selective estrogen receptor modulators; use of erythropoietin-stimulating agents. Some risk factors are transient (surgery, trauma, temporary immobilization in a cast), while others are permanent (such as congenital thrombophilia). Causes of upper extremity DVT: An indwelling central venous catheter (the most frequent cause); compression of the subclavian or axillary vein by enlarged lymph nodes; a malignant infiltrate; a fractured clavicle; compression of the veins by the scalene muscles between the clavicle and the tendon of the subclavius muscle or the residual tendon band in the axillary fossa associated with strenuous physical activity or bodybuilding (Paget-Schrötter syndrome). 1) Distal DVT involves one of the calf veins (peroneal, anterior, posterior tibial). It is usually asymptomatic, resolves spontaneously, and is associated with a low risk of clinically significant pulmonary embolism (PE), but can progress to proximal vein thrombosis. 2) Proximal DVT involves one or more of the popliteal, femoral, and iliac veins, and rarely extends into the inferior vena cava. It is usually symptomatic and carries a high risk of PE if untreated. Extensive DVT is an anatomic distinction that refers to DVT involving iliofemoral vein segments, and may warrant a different treatment approach than less extensive DVT. Massive DVT is a clinical distinction that refers to DVT manifesting with phlegmasia and is limb-threatening; most cases of massive DVT are extensive anatomically, that is, they involve the iliofemoral veins. Submassive DVT is seen most commonly (>90% of cases) and is not limb-threatening. 3) Phlegmasia dolens: An acute form of DVT involving the majority of the veins of the limb, accompanied by pain and massive edema. a) Phlegmasia alba dolens: Severe edema, spasm of the arterioles in the skin, impaired capillary flow. b) Phlegmasia cerulea dolens: The most severe form of DVT associated with an increased risk of amputation or death. Patients develop occlusion of nearly all veins in the limb, which leads to a significant increase in venous pressure and impairment of blood flow in the congested vascular bed, thus resulting in tissue hypoxia. Signs and symptoms: DVT is often asymptomatic or manifests as minor symptoms only. The patient may complain of calf pain while walking. Edema of the lower leg or the entire limb may be seen, sometimes perceived as a thickening, in which case it is necessary to compare the circumferences of the limbs (in unilateral thrombosis the difference is ≥2 cm); 70% of cases of unilateral edema of the lower limb are caused by DVT. Bilateral edema may be caused by bilateral DVT, thrombosis of the inferior vena cava, or conditions unrelated to thrombosis. Tenderness or pain on palpation may be present, with some patients complaining of limb pain at rest and in rare cases developing the Homans sign (calf pain that occurs with passive dorsal flexion of the foot). The limb may be warm and dilation of the superficial veins may persist with the limb elevated at a 45 degrees Celsius angle. Low-grade or sometimes high-grade fever may be seen (due to inflammation of the tissues adjacent to the thrombotic vein). In patients with phlegmasia alba dolens, the skin of the limb is pale. Phlegmasia cerulea dolens causes massive edema and severe pain at rest; the limb (usually the foot) initially turns cyanotic and subsequently, with the development of necrosis, its color changes to black. 2. Upper extremity DVT usually involves the axillary and subclavian veins. Limb edema and pain are the predominant symptoms. 3. Complications of DVT: Deep venous thrombi may undergo fragmentation, thus becoming embolic material that is carried into the pulmonary circulation. 1) A newly formed deep venous thrombus may detach from the vascular wall or undergo fragmentation and subsequently be carried to the lungs and cause PE. A massive PE may block pulmonary blood flow and cause cardiac arrest, which may be the initial manifestation of DVT. Undiagnosed and untreated DVT can be complicated by recurrent PE caused by small fragments of the thrombi that embolize and frequently is misdiagnosed as pneumonia or asthma. 2) Rarely, DVT may cause stroke or systemic embolism as a result of a paradoxical embolism in patients with a functional right-to-left cardiac shunt (eg, a patent foramen ovale). 3) Long-term complications of DVT include postthrombotic syndrome (chronic venous insufficiency) as well as pulmonary hypertension as a complication of PE. In approximately two-thirds of patients treated for DVT, the thrombus undergoes organization and the affected vein is partially recanalized (a total dissolution of the thrombus occurs only in a third of patients). This leads to chronic venous insufficiency and postthrombotic syndrome: organization of the thrombus results in damage to the venous valves, a retrograde flow of venous blood, and eventually in venous hypertension. Due to the subtle and nonspecific clinical manifestations of VTE, it should be considered in patients with suggestive clinical features, especially when an alternative diagnosis is unlikely or has been excluded. Whenever in doubt, attempt to confirm or exclude the diagnosis of DVT, because the disease is associated with a high risk of complications (including death) if left untreated. A prompt diagnosis of VTE allows initiation of anticoagulant therapy, which is highly effective at preventing VTE-related sequelae. 1. Measurement of plasma D-dimer levels: The test performed to exclude DVT and PE (the reference range and cutoff values depend on the assay; most frequently thrombosis is unlikely in patients with D-dimer levels <500 microg/L). The diagnosis of VTE cannot be made on the basis of an increase in D-dimer levels alone, because an elevated D-dimer level is nonspecific and can occur with infection, inflammation, or other conditions not associated with thrombosis (eg, cancer). However, in patients with a low to intermediate clinical suspicion for DVT (assessed using a validated clinical prediction guide such as the Wells score), a normal D-dimer value when using a high-sensitivity D-dimer assay (eg, enzyme-linked immunosorbent assay-based) is associated with a low likelihood for DVT (≤2%). 2. Compression ultrasonography (CUS) is the key method of confirming proximal vein thrombosis. A positive result means that a vein filled with thrombi does not collapse when compressed by the transducer. Ultrasonography of the entire deep vein system of the limb allows for the detection of distal thrombosis. In patients who have below-knee CUS for detection of distal thrombosis, this should be done by an experienced vascular laboratory, since below-knee CUS may produce a high proportion of false-positive and false-negative results. In the case of suspected DVT always attempt to confirm or exclude the diagnosis to allow a prompt initiation of anticoagulant therapy (if confirmed) and avoidance of anticoagulation and associated bleeding risk (if excluded). The diagnosis is based on a combination of the assessment of the clinical probability of thrombosis (eg, using the Wells score: Table 1), measurements of D-dimer levels, and/or CUS. If the diagnosis based on ultrasonography is doubtful, repeat the study; in exceptional cases, consider magnetic resonance venography or computed tomography (CT) venography. 1) A low clinical probability of DVT: Measure D-dimer levels using a high-sensitivity (~95%) or moderate-sensitivity (~85%) assay. A negative D-dimer result is sufficient to exclude DVT.Evidence 1Strong recommendation (benefits clearly outweigh downsides; right action for all or almost all patients). High Quality of Evidence (high confidence that we know true effects of intervention). Bates SM, Jaeschke R, Stevens SM, et al; American College of Chest Physicians. Diagnosis of DVT: Antithrombotic Therapy and Prevention of Thrombosis, 9th ed: American College of Chest Physicians Evidence-Based Clinical Practice Guidelines. Chest. 2012 Feb;141(2 Suppl):e351S-418S. doi: 10.1378/chest.11-2299. PubMed PMID: 22315267; PubMed Central PMCID: PMC3278048. In patients with a positive result, perform CUS; if the CUS is negative, no further testing is needed.Evidence 2Strong recommendation (benefits clearly outweigh downsides; right action for all or almost all patients). Moderate Quality of Evidence (moderate confidence that we know true effects of intervention). Quality of Evidence lowered due to imprecision. Bates SM, Jaeschke R, Stevens SM, et al; American College of Chest Physicians. Diagnosis of DVT: Antithrombotic Therapy and Prevention of Thrombosis, 9th ed: American College of Chest Physicians Evidence-Based Clinical Practice Guidelines. Chest. 2012 Feb;141(2 Suppl):e351S-418S. doi: 10.1378/chest.11-2299. PubMed PMID: 22315267; PubMed Central PMCID: PMC3278048. 2) An intermediate clinical probability of DVT: Measure D-dimer levels using a high-sensitivity (~95%) assay. A negative D-dimer result is sufficient to exclude thrombosis.Evidence 1Strong recommendation (benefits clearly outweigh downsides; right action for all or almost all patients). High Quality of Evidence (high confidence that we know true effects of intervention). Bates SM, Jaeschke R, Stevens SM, et al; American College of Chest Physicians. Diagnosis of DVT: Antithrombotic Therapy and Prevention of Thrombosis, 9th ed: American College of Chest Physicians Evidence-Based Clinical Practice Guidelines. Chest. 2012 Feb;141(2 Suppl):e351S-418S. doi: 10.1378/chest.11-2299. PubMed PMID: 22315267; PubMed Central PMCID: PMC3278048. In patients with a positive result, perform CUS; if the CUS is negative, repeat it after 5 to 7 days.Evidence 2Strong recommendation (benefits clearly outweigh downsides; right action for all or almost all patients). Moderate Quality of Evidence (moderate confidence that we know true effects of intervention). Quality of Evidence lowered due to imprecision. Bates SM, Jaeschke R, Stevens SM, et al; American College of Chest Physicians. Diagnosis of DVT: Antithrombotic Therapy and Prevention of Thrombosis, 9th ed: American College of Chest Physicians Evidence-Based Clinical Practice Guidelines. Chest. 2012 Feb;141(2 Suppl):e351S-418S. doi: 10.1378/chest.11-2299. PubMed PMID: 22315267; PubMed Central PMCID: PMC3278048. 3) A high clinical probability of DVT or intermediate probability of DVT without the possibility to measure D-dimer levels using a high-sensitivity (~95%) assay: Perform CUS, and if the result of the study is negative, repeat it after 5 to 7 days.Evidence 2Strong recommendation (benefits clearly outweigh downsides; right action for all or almost all patients). Moderate Quality of Evidence (moderate confidence that we know true effects of intervention). Quality of Evidence lowered due to imprecision. Bates SM, Jaeschke R, Stevens SM, et al; American College of Chest Physicians. Diagnosis of DVT: Antithrombotic Therapy and Prevention of Thrombosis, 9th ed: American College of Chest Physicians Evidence-Based Clinical Practice Guidelines. Chest. 2012 Feb;141(2 Suppl):e351S-418S. doi: 10.1378/chest.11-2299. PubMed PMID: 22315267; PubMed Central PMCID: PMC3278048. 2. Hospitalized patients: It is necessary to perform CUS due to the low specificity and predictive value of positive D-dimer test results (the level is increased in many hospitalized patients, for instance due to major trauma, surgery, cancer, or inflammation), and sometimes also a reduced sensitivity of the assay (due to the use of anticoagulants or the assay being performed a few days after the onset of clinical manifestations). In patients with a negative CUS result and a high probability of DVT, repeat CUS after 5 to 7 days. In patients with a lower probability of DVT, measure the D-dimer level, and if positive, repeat CUS. Limb injury (most frequent), chronic venous insufficiency (dysfunction of the venous valves, venous muscle pump, and plantar venous pump), superficial vein thrombosis, a Baker cyst (the posterior protrusion of the popliteal bursa [eg, due to trauma or in association with rheumatoid arthritis], which may rupture or compress the popliteal vein; this condition may cause thrombosis upon severe compression or as a result of local inflammation), cellulitis or lymphangiitis, drug-induced edema (particularly in patients treated with calcium-channel blockers; edema is usually bilateral), lymphedema (in a third of patients with severe chronic venous insufficiency), hematomas of the lower leg muscles, plantaris muscle tendon rupture, myositis, tendinitis (particularly involving the Achilles tendon), or arthritis. 1. Treatment of symptomatic and asymptomatic DVT is the same. Management algorithm: Figure 1. 2. Conventional anticoagulant therapy is used for patients with clinically submassive DVT, whereas thrombolytic therapy is considered for patients with massive DVT. Submassive DVT is characterized by proximal vein thrombosis, which may extend into the iliofemoral vein segment, but does not produce severe symptoms and signs. Massive DVT, which typically involves the iliofemoral veins, is characterized by severe symptoms and signs that include extensive entire leg swelling, phlegmasia cerulea dolens, and limb ischemia. 1) The patient is clinically stable with normal vital signs. 2) There are no severe symptoms (severe pain and major edema of the lower limbs). 3) The risk of bleeding is low. 4) The patient has a creatinine clearance >30 mL/min. 5) An appropriate follow-up care is provided. 4. Early mobilization (this applies to the majority of patients): The patient should remain in bed with the limb elevated (with the lower leg in a horizontal position, the thigh directed at an angle towards the pelvis, and the limb supported along its whole length) only on the day the diagnosis of DVT is made and heparin treatment started. 5. Treatment with graduated compression: Elastic compression stockings (pantyhose, stockings, or knee-high socks are available; in most cases knee-high socks are sufficient) should not be routinely used in all patients with DVT, but should be considered in patients with edema or other swelling. Typically, elastic compression stockings are initiated during the first week after diagnosis when the associated pain and inflammation have subsided enough to allow the patient to comfortably wear the stockings. The patient should wear a knee-high sock or stocking (or bandage) throughout the day and walk as much as possible; at night it should be taken off, and the bed mattress in the region of the leg should be elevated by 10 to 15 cm. Contraindications to compression treatment include phlegmasia cerulea dolens, concomitant limb ischemia due to arterial disease (measure the ankle-brachial index [ABI] or at least make sure that the pulse assessed on the dorsalis pedis artery and posterior tibial artery is present and symmetric on both lower extremities), and severe peripheral neuropathy. 6. Anticoagulant treatment: see below; this treatment modality is of key importance. 7. Placement of inferior vena caval filters should be considered in patients with acute proximal DVT of the lower extremities in whom the use of anticoagulants at therapeutic doses is contraindicated (because of the risk of bleeding or need for a major surgical procedure that cannot be postponed) or ineffective (recurrent PE or a significant enlargement of the thrombus despite an adequate anticoagulant treatment). Retrievable filters, which are typically removed after 1 to 3 weeks, are preferred. Anticoagulant treatment should be started or resumed once the risk of bleeding has decreased. 1) Patients with clinically massive DVT (eg, iliofemoral DVT with severe edema and pain), <14 days from the onset of symptoms, who are in good general condition (a low risk of bleeding). 2) Patients with early upper extremity DVT (<14 days from the onset of symptoms) or at risk of amputation. Thrombolytic agents are administered locally via a catheter inserted into the thrombus; this is preferably combined with mechanical fragmentation of the thrombus and aspiration of its fragments. Following a successful thrombolysis, use the same anticoagulant treatment as in similar patients receiving medical treatment only. 1. General principles of anticoagulant treatment in VTE: Figure 2. 2. 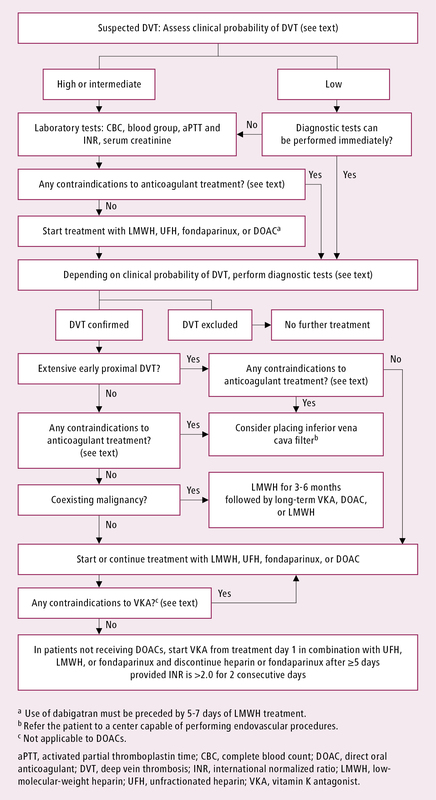 In patients with a high or intermediate clinical probability of DVT or with confirmed DVT, start anticoagulant treatment immediately once contraindications have been excluded, even if the results of diagnostic tests are not yet available. If the tests cannot be performed promptly and the probability of DVT is at least intermediate, start treatment before the diagnosis is established. In nonhospitalized patients with acute isolated distal lower extremity DVT (veins of the lower leg [peroneal vein; anterior and posterior tibial veins]), it is suggested to start anticoagulant therapy if there are severe symptoms or risk factors for thrombus extension (eg, positive D-dimer test results, active cancer, immobility, thrombus in close proximity to the proximal veins, thrombus >5 cm in length). In patients who have mild to moderate symptoms and do not have risk factors for thrombus extension, it is suggested to withhold anticoagulant therapy and undertake serial compression ultrasonography over 2 weeks. If there is worsening of symptoms or evidence of thrombus extension into the proximal veins on ultrasonography testing, it is suggested to start anticoagulant therapy.Evidence 3Weak recommendation (benefits likely outweigh downsides, but the balance is close or uncertain; an alternative course of action may be better for some patients). Low Quality of Evidence (low confidence that we know true effects of the intervention). Quality of Evidence lowered due to the risk of bias and imprecision. Kearon C, Akl EA, Comerota AJ, et al; American College of Chest Physicians. Antithrombotic therapy for VTE disease: Antithrombotic Therapy and Prevention of Thrombosis, 9th ed: American College of Chest Physicians Evidence-Based Clinical Practice Guidelines. Chest. 2012 Feb;141(2 Suppl):e419S-94S. doi: 10.1378/chest.11-2301. Erratum in: Chest. 2012 Dec;142(6):1698-1704. PubMed PMID: 22315268; PubMed Central PMCID: PMC3278049. 1) Subcutaneous LMWH at a therapeutic dose every 12 hours (initial treatment) or every 24 hours (in long-term and outpatient treatment) (Table 2). If the clinical efficacy of LMWH is questionable (eg, thrombus progression is seen), measure the anti-Xa level (preferably 4 hours after the last LMWH administration; the target anti-Xa levels are 0.6 to 1.0 U/mL in patients receiving LMWH every 12 hours and 1 to 1.3 U/mL in those receiving LMWH once daily). If anti-Xa measurement is not feasible, administer IV UFH and monitor the activated partial thromboplastin time (aPTT). a) Intravenous administration: Inject 80 U/kg (or up to 5000 U) as an IV bolus followed by a continuous IV infusion at the rate of 18 U/kg/h (or up to 1300 U/h). Assess the aPTT after 6 hours. If the aPTT value is within the therapeutic range (a 1.5-fold to 2.5-fold prolongation compared to the reference value; usually the aPTT in the course of treatment should be 60-90 seconds), continue the infusion at the same dose (the average maintenance dose is 25,000-35,000 U/d); otherwise increase or decrease the dose of UFH accordingly (Table 3). b) Subcutaneous administration: If the anticoagulant effect is being monitored, use a concentrated formulation of 25,000 U/mL, initially 80 U/kg IV followed by 250 U/kg subcutaneously every 12 hours, and adjust the doses so that 6 hours after the injection of the drug the aPTT remains in the therapeutic range (the average maintenance dose is 17,500 U every 12 hours). If the anticoagulant effect is not being monitored, start with 333 U/kg subcutaneously, followed after 12 hours by 250 U/kg subcutaneously every 12 hours. In patients who fail to achieve the target aPTT values despite the use of high-dose UFH, adjust the dose on the basis of the anti-Xa levels. 3) Fondaparinux: Administer 7.5 mg subcutaneously every 24 hours. In patients with a body weight >100 kg, you may increase the dose to 10 mg every 24 hours. 4) Rivaroxaban: Administer 15 mg orally bid for 3 weeks, followed by 20 mg once daily (15 mg if GFR is <50 mL/min; do not use if GFR is <30 mL/min). 5) Apixaban: Administer 10 mg orally bid for the first 7 days, then 5 mg bid. In long-term treatment (>3 months), use 2.5 mg bid. 6) Dabigatran: Switch from LMWH or UFH to dabigatran after 5 to 7 days of LMWH or UFH treatment; administer dabigatran 150 mg orally bid (110 mg bid is suggested in patients at high risk of bleeding). 1) In the majority of patients in whom VKA use is planned, these agents should be administered from the first day of treatment. Discontinue heparin and fondaparinux if the international normalized ratio (INR) is ≥2.0 for 2 consecutive days of combination treatment with VKAs, but not earlier than after 5 days of the administration of heparin or fondaparinux. Do not discontinue heparin/fondaparinux on the day of starting the VKA, because in the first days the anticoagulant effect of VKAs is incomplete, and therefore the concomitant administration of heparin/fondaparinux is necessary. 2) In patients with extensive iliofemoral DVT causing severe edema and limb pain, use heparin or LMWH for 7 to 10 days (or longer, until symptom relief) and consider deferring the start of VKA administration. a) Pregnant women with VTE, since VKAs cross the placenta and may be harmful to the developing fetus. b) Patients with cancer, as LMWHs are more effective and safer; the agents should be used at least during the first 3 to 6 months of treatment. c) When regular and accurate INR monitoring cannot be performed. d) If the current episode of VTE occurred despite the administration of appropriate doses of a VKA. 1) Start the administration of acenocoumarol or warfarin simultaneously with heparin or fondaparinux, usually on the first day of treatment. If you plan to use heparin for >7 days (point 4 above), you may delay the administration of a VKA. 2) In the first 2 days, use 6 mg of acenocoumarol or 10 mg of warfarin; do not use >6 mg of acenocoumarol or >10 mg of warfarin. In the elderly, debilitated, or malnourished patients, as well as in patients with heart failure, liver disease, those receiving drugs that enhance the effects of VKAs, or those at increased risk of bleeding, start treatment with 4 mg of acenocoumarol or 5 mg of warfarin. 3) Assess the INR on day 3 and adjust the dose on the basis of the results. 4) In patients with an INR ≥2.0 for 2 consecutive days, discontinue heparin/fondaparinux and continue treatment with a VKA alone for a time dependent on the risk of relapse (≥3 months; Table 4) at doses adjusted to maintain the INR within the range of 2.0 to 3.0. 5) Principles of safe VKA treatment (contraindications, monitoring, dose adjustment, management of complications): see Vitamin K Antagonists. 1) Rivaroxaban or apixaban may be used from the beginning of DVT treatment. 2) Unlike with VKAs, it is not necessary to start treatment with the concomitant administration of heparin. 3) As the cost of rivaroxaban treatment is higher than that of VKA treatment, consider whether the patient will be able to continue the therapy for several months. Note that due to its shorter duration of action, skipping a dose of rivaroxaban may have more serious consequences than in the case of VKAs. 1) Dabigatran is used only after 5 to 7 days of LMWH treatment. 2) Bearing in mind that the cost of dabigatran treatment is higher than that of VKA treatment, consider whether the patient will be able to continue the therapy for several months. Note that due to its shorter duration of action, skipping a dose of dabigatran may have more serious consequences than in the case of VKAs. 1. Patients with VTE require long-term anticoagulant treatment if there is a high risk of recurrent thrombosis and their risk for bleeding is not high. The risk is higher in the case of cancer, severe thrombophilia (eg, antithrombin deficiency, antiphospholipid antibody syndrome), elevated postanticoagulation serum D-dimer levels, or a history of recurrent VTE. 2. Methods of preventing recurrence of VTE after upper or lower extremity DVT and after PE are similar. In the majority of patients, best results are obtained with long-term administration of VKAs at a dose that maintains the INR in the range of 2.0 to 3.0. LMWHs are recommended in patients with cancer. The recommended duration of anticoagulant treatment depends on the clinical condition (Table 4) and the risk of bleeding (Table 5). 3. In patients with recurrent VTE despite maintaining the INR in the range of 2.0 to 3.0, consider the use of VKAs at a dose that maintains INR in the range of 2.5 to 3.5. This therapeutic range may be also more adequate for patients with antiphospholipid antibodies (APLAs) and additional VTE risk factors or with a thromboembolic event despite maintaining the INR in the range of 2.0 to 3.0, as well as in patients with an elevated baseline INR due to the presence APLAs. 4. If VKAs cannot be used (eg, if regular monitoring of anticoagulant effects is contraindicated or not feasible), administer a novel oral anticoagulant (NOAC) or LMWH subcutaneously. 5. To prevent recurrent VTE in the course of long-term treatment, you may consider switching from a VKA to rivaroxaban 20 mg once daily or to dabigatran 150 mg bid (consider using lower doses in patients at high risk of bleeding). 6. Periodically evaluate the benefits and risks of the anticoagulant treatment, as it reduces the risk of VTE recurrence but at the same time increases the risk of bleeding. 7. Compression therapy: Use class II compression elastic stockings (Table 1 in Chronic Venous Insufficiency) in patients with persistent edema or other leg swelling. In most cases, knee-length socks are the best option when fitted to the size of the limb in accordance with the manufacturer’s recommendations. 1) Subcutaneous LMWHs (the preferred treatment) at doses adjusted to the body weight before pregnancy, administered until the end of the pregnancy. Monitoring of anti-Xa levels every 1 to 3 months in the course of treatment is recommended (if available). Measure the anti-Xa level ~4 hours after the last injection of LMWH; the target levels are 0.6-1.0 U/mL in patients receiving LMWHs every 12 hours and 1-1.3 U/mL in those receiving LMWHs every 24 hours. a) Intravenous administration (as initial treatment and in certain situations: see below): Inject 80 U/kg (or up to 5000 U) as an IV bolus followed by a continuous IV infusion at a dose that maintains the aPTT in the therapeutic range for 5 days (a 1.5-fold to 2.5-fold prolongation compared to the reference value; usually in the course of treatment the aPTT should be 60-90 seconds), then treat the patient with subcutaneous LMWHs or UFH until the end of pregnancy. b) Subcutaneous administration at an individually adjusted dose until the end of pregnancy: Start with the subcutaneous administration of 333 U/kg followed after 12 hours by 250 U/kg every 12 hours, and adjust the dose to maintain the aPTT within the therapeutic range 6 hours after the injection (the average maintenance dose is 17,500 U every 12 hours). 2. Use heparin at an individually adjusted dose for ≥3 months. Subsequently, you can reduce the dose by 25% to 50% without a loss of efficacy, especially in women at an increased risk of bleeding or osteoporosis. 3. Management at delivery: The delivery should be planned. In patients with VTE there is no preference for either cesarean section or induced vaginal delivery. 1) Before the planned induction of vaginal delivery or cesarean section, discontinue subcutaneous LMWH/UFH 24 hours prior to the scheduled time of delivery. 2) Before the planned induction of vaginal delivery or cesarean section in patients at a very high risk of VTE recurrence (eg, proximal lower extremity DVT within 4 prior weeks), switch from subcutaneous LMWH/UFH to a full therapeutic dose of intravenous UFH and then discontinue heparin 4 to 6 hours before the scheduled time of delivery. You may consider placing a retrievable inferior vena caval filter before the delivery and removing it afterwards (this may be used in special situations only, eg, VTE within 4 weeks, as sometimes the filter cannot be retrieved). 3) Spontaneous labor: In women receiving subcutaneous UFH, closely monitor the aPTT. If it is significantly prolonged at labor, consider the administration of protamine (dosage: see Heparins). 4) Spinal or epidural anesthesia can be administered as long as the last dose of LMWH was 24 hours ago, the last dose of subcutaneous UFH was 12 hours ago, or intravenous UFH was stopped 4 to 6 hours ago. 4. Postdelivery management: For 6 weeks (or longer, so that the entire duration of anticoagulant treatment is ≥6 months) use VKAs at a dose that maintains the INR in the range of 2.0 to 3.0, initially in combination with LMWHs or UFH until an INR ≥2.0 is achieved on 2 consecutive days. 2. Prevention of recurrent VTE by appropriate treatment of a VTE episode: see Duration of Treatment, above. a If symptoms occur in both lower limbs, the limb in which symptoms are more severe should be assessed. a Sample numerical values expressed in seconds may vary depending on the reference (control) values in a given laboratory. b The therapeutic aPTT range of 46-70 seconds should correspond to the anti-Xa activity of 0.3-0.7 U/mL. Note: Repeat the aPTT and adjust the unfractionated heparin dose after 6 hours. aPTT, activated partial thromboplastin time; IV, intravenous. a Risk factors for bleeding: see Table 5 in Deep Vein Thrombosis. b The need for continued treatment should be assessed periodically (eg, once a year). DVT, deep vein thrombosis; VTE, venous thromboembolism. With an increase in the severity of individual factors and with an increase in the number of factors present, the risk of bleeding is expected to increase (both at baseline and while on anticoagulants). a Young (eg, <65 years) healthy patients with good VKA control will have a low risk of major bleeding (≤1% per patient-year), those with less severe factors have an intermediate risk, and elderly patients with severe or multiple factors are at high risk for major bleeding (>4% per patient-year). Based on: Kearon C, Akl EA. Duration of anticoagulant therapy for deep vein thrombosis and pulmonary embolism. Blood. 2014 Mar 20;123(12):1794-801. doi: 10.1182/blood-2013-12-512681. Epub 2014 Feb 4. Review. PubMed PMID: 24497538. Figure 1. Management algorithm of lower extremity deep venous thrombosis. Based on the 2012 American College of Chest Physicians guidelines (see Additional Information for details). Figure 2. General principles of anticoagulant treatment in patients with venous thromboembolism. Based on the 2012 Polish guidelines (see Additional Information for details).